It’s your favorite trash day. 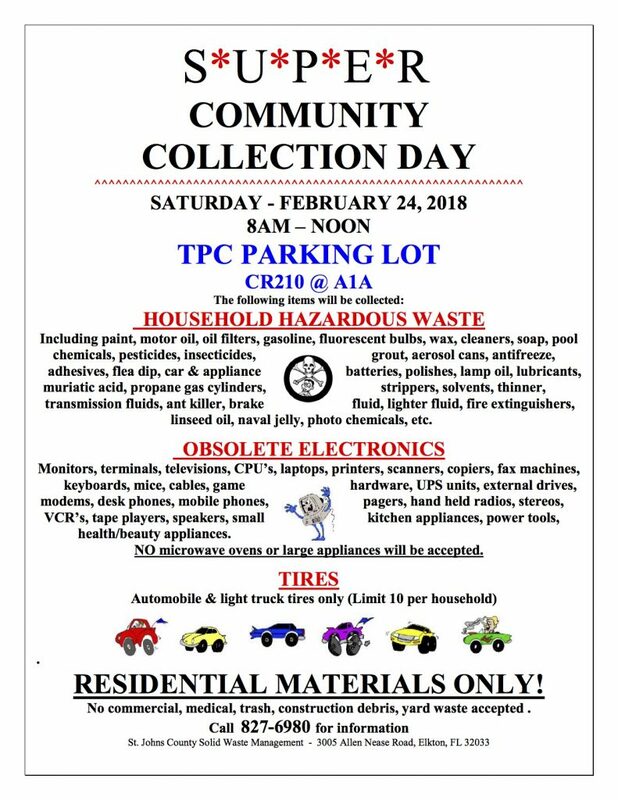 Gather all your items that you don’t know what to do with and take them to the TPC Parking Lot (Palm Valley Road at A1A across from Walgreens) this Saturday, February 24 between 8 AM and 12 PM. Including paint, motor oil, oil filters, gasoline, fluorescent bulbs, wax, cleaners, soap, pool chemicals, pesticides, insecticides, adhesives, flea dip, car & appliance muriatic acid, propane gas cylinders, transmission fluids, ant killer, brake grout, aerosol cans, antifreeze, batteries, polishes, lamp oil, lubricants, strippers, solvents, thinner, fluid, lighter fluid, fire extinguishers, linseed oil, naval jelly, photo chemicals, etc. stereos, VCR’s, tape players, speakers, small kitchen appliances, power tools, health/beauty appliances. NO microwave ovens or large appliances will be accepted. No commercial, medical, trash, construction debris, yard waste accepted.